Justin Timberlake has amassed a plethora of standout tracks, from songs he made during his boy-band days to guest appearances on other records to his comedy stylings with Jimmy Fallon and Andy Samberg. But his best song didn’t reach number one in the U.S., and never reached gold or platinum status. 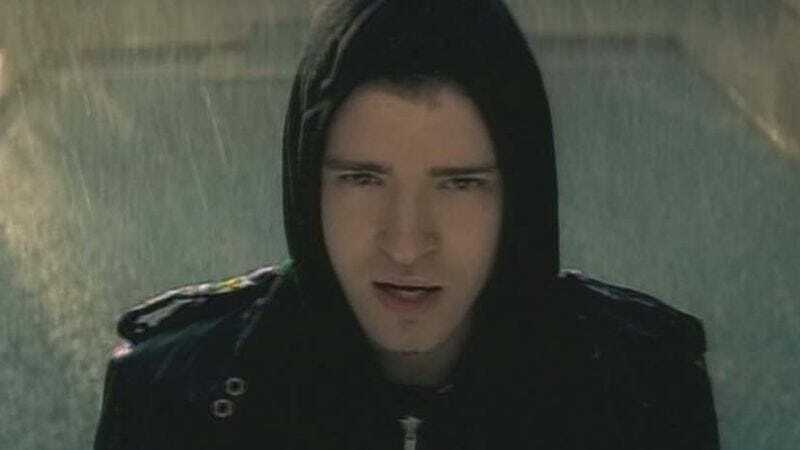 “Cry Me A River” is the first definitively powerful musical statement Timberlake made to create a separation between his ’N Sync days and what has become a prosperous solo career in music, comedy, and film. It declared, “I am here, I am a solo artist from now on, and I am a force to be reckoned with.” Justifiably (pardon the pun), it remains his most resonant early track, the sign of early promise that still stands with the more expansive later hits. It didn’t hurt that a ton of personal turmoil fueled the story behind the song. His relationship with Britney Spears abruptly ended—and their lives took wildly different paths after that event, with Timberlake’s greatest chart success in his future with FutureSex/LoveSounds, and Spears becoming a constant tabloid presence. With smoldering and soaring vocals over densely infectious production that includes distinctive touches of Gregorian chant and an unforgettable synth melody, “Cry Me A River” drips heavily concentrated vengeance from every note. Wringing personal drama into pop mastery, Timberlake achieved his first creative peak by giving over to a dangerous, lurking vibe that dirtied his previously squeaky-clean image. Valiantly as he still tries to deflect the idea that Spears had anything to do with the song, the video extends the revenge fantasy even further. Producer Timbaland—who provides the booming bridge line, “The damage is done so I guess I’ll be leaving”—drives Timberlake to a woman’s house where he shatters a floor-to-ceiling window with a rock, then stalks through the house reveling in the catharsis of home invasion. There’s too much in the text of the song and the video to dismiss the personal underpinning as merely inspired by general relationship turmoil, and it’s about time Timberlake admitted breaking up with Britney Spears inspired the song that helped launch his career.